I welcome approaches from creative writers and poets seeking advice about small-run publishing projects. Red Herring is a new venture in publishing for me. It is not a commercial enterprise – it is not for profit. I have established it as an imprint to develop my own publishing projects and to assist authors who want to produce a small number of hand-bound books for themselves. A slim volume of ten pages of poetry for instance can be bound in a very simple and pleasing way using beautiful papers and with relatively little expense. I can offer help and advice with production. I do not undertake the desktop publishing / layout work on computer unless it is very simple, but can recommend and work with a book layout designer. I work with creative writers, designers and poets and would welcome a discussion about your publishing project, call me or drop me a line using the form below. Shortlisted for the Amberley Press Publishing Prize in 2017, Curlew Coast is the author’s second book and it continues the theme of tracing maritime history through the framework of the coastal towns and villages of Suffolk. It explores a diversity of subjects from rope-making to ship burials; from the coastal erosion to the early navigators and from salt-making to the evolution of Trinity House. Illustrated lavishly from the author’s sketches, it covers the period from when the Anglo-Saxons first sailed up the East Anglian rivers to when the railway began to take over from sail. Judith Ellis has recently written and illustrated a book on maritime Norfolk and is currently working towards publishing a similar volume on Suffolk, which is due for publication in 2018. Spanning the period from the Anglo-Saxons to the coming of the railway, it is about the boats, the fishing and some of the lives lived on the North Sea coast of Norfolk, from the once world famous herring fishery in Great Yarmouth to the extraordinary rescues of Cromer’s famous lifeboat man Henry Blogg. Illustrated throughout with Judith’s sketches, painted maps add clarity to the text and red herrings appear all through the pages flagging up interesting facts and generally looking cheerful. If you stand on the cliffs at Cromer and look northwards you are facing the Arctic. If you were to travel in a straight line just to the east of the Greenwich Meridien, you would pass beyond the North Sea into the North Atlantic, passing Shetland on your left and Bergen in southern Norway on your right, and you might just catch a glimpse of Iceland far away to your left. To travel with a little more easting would bring you to the Netherlands, northern Germany and Denmark. Entering the water between Denmark and Sweden, the Skagerrak, would bring you to the Baltic Sea connecting you with Sweden, Eastern Europe and Russia. The author lives in Norfolk with a small hairy dog, an insatiable curiosity and some very fine memories of sailing off the East Anglian coast. A life-long interest in traditional boats combined with a love of history and sketching has found expression in this unusual book. 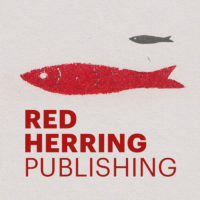 Red Herring is a not-for-profit publisher and works with creative writers, designers and poets on small scale publishing projects. Call Judith or drop her a line using the contact form on this page to discuss your publishing needs.